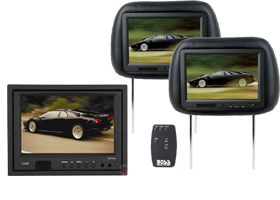 Headrest Monitors gives your passengers the entertainment they need , especially on long trips. These state-of-the-art monitors gives your ride a classy look that separates yours from your grandmas. Mounts onto the front seat with remote control options. Comes in a variety of colors, materials and textures, giving you the option to find the perfect match for your vehicles interior. Hook it up with your in-dash DVD players and awesome audio sound system, Your passengers will definitely gonna be in for the ride!